Alcohol intolerance, which may be perceived as a wine or beer allergy, can lead to uncomfortable reactions almost immediately upon consumption. 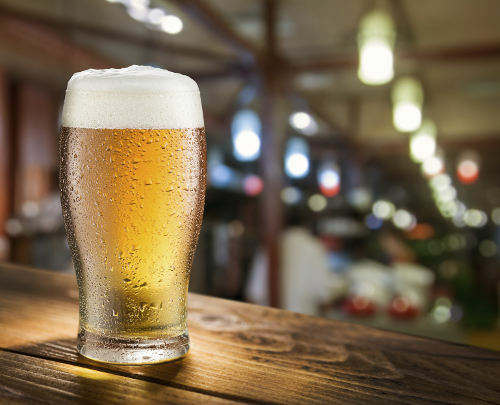 Caused by a genetic condition that limits alcohol digestion and absorption, the so-called beer allergy symptoms can include flushing, bloating, and a stuffy nose. Alcohol intolerance isn’t actually an allergy. It’s like lactose intolerance—the body simply doesn’t break the substance down. You may, however, be allergic to some of the ingredients used to make beer—hops, grains, etc. —that prompt more traditional allergy symptoms. What Causes a Beer Allergy? A true allergic reaction occurs when the allergen in question produces the IgE antibody. With beer or wine, this can occur even if you only drink a small amount and will trigger symptoms like those that accompany other types of food allergies. Since different beers are made with different ingredients, it is possible to be allergic to one type of beer but not another. If you are allergic to a type of grain or gluten, then you will also have problems eating other types of foods. When your doctor is taking your history, any allergy-like symptoms from other foods will help narrow down the potential culprit. A 2014 study of 27 Chinese individuals with a history of beer allergy found that sorghum or sorghum malt sensitivity was the most common source. There has also been some discussion around the presence of genetically-modified (GMO) ingredients in beers. However, they are unlikely to bolster allergic reactions. If you’re allergic to GMO corn—which is found in countless foods—you’re probably allergic to organic corn, too. A beer allergy is a type of food allergy, so the effects are similar. True beer allergy symptoms include hives, wheezing, chest pain, nausea, abdominal pain, and flushing. As with other food allergies, it is possible to have a reaction severe enough to trigger anaphylaxis, which is an extreme allergic reaction. Incidentally, alcohol is known to make any existing food sensitivities more pronounced and to increase the severity of food allergy reactions. This is because alcohol also increases gut permeability and allows more food to pass into the body, which aggravates any responses that might be triggered from what you’re eating. If you experience allergy symptoms from beer, they will likely run the gamut. Again, wheat, barley, hops, and corn can all be the culprit of your beer allergy. Diarrhea and indigestion may occur as a result of both the allergy and alcohol intolerance, and may be experienced on an individual basis. Because both alcohol and allergic reactions lead to inflammation, it could also mean double the discomfort when it comes to joint pain. Systemic inflammation is known to cause joint pain, as is dehydration. Alcohol, regardless of the presence of an allergy or intolerance, can cause dehydration. Excessive alcohol and beer consumption can also lead to joint pain by contributing to gout. Food or alcohol sensitivities and intolerances refer to the same phenomenon: unpleasant symptoms resulting from eating a specific food or ingredient. The symptoms of intolerance have a large amount of overlap with those from a food allergy, so it is understandable that they get confused. How can you tell the difference? Food or alcohol allergies are an immune reaction—no IgE antibody, no allergy. Sensitivity usually means that some part of the food or alcohol cannot be digested properly (lactose intolerance or Celiac are some examples) or that it aggravates an underlying condition like irritable bowel syndrome—there is no immune involvement. Food sensitivities cannot cause anaphylaxis or hives. It is possible to avoid triggering a food sensitivity by eating only a small amount. It is sometimes possible to prevent a sensitivity reaction by taking medication before consuming the food in question; allergies do not have this luxury. Can a Beer Allergy Be Diagnosed? A beer allergy diagnosis would be provided indirectly. This is because you would not be allergic to beer itself, but rather one or more of the ingredients. The doctor would first ask you to describe the symptoms you experience after drinking a beer, and then likely follow up with a skin test. If you showed an allergy to wheat, sorghum, or one of the other ingredients or allergens in beer, you would technically be allergic to that ingredient. But because it is a required ingredient in beer, you’d essentially be allergic to beer, too. A diagnosis of allergy to one of the ingredients in beer would also mean you’d want to avoid other products with the same allergen. Avoidance is always the best way to avoid food allergies. Depending on which ingredient you are allergic to, you might still be able to drink beer if you watch your labels. Over-the-counter antihistamines can be used to treat mild cases of rashes, hives, or itching. If there is a risk or history of suffering a severe reaction, carrying an “EpiPen” may be recommended by your doctor. Wearing a medical alert bracelet (or necklace) can help alert bystanders if you suffer a reaction severe enough to incapacitate you. If you’ve noticed minor symptoms after drinking beer, then you can probably just avoid the drink and be fine. If you’re interested in learning which ingredient may be leading to your symptoms, schedule an allergy test. However, if you experience extreme symptoms like a swollen tongue or throat or difficulty breathing, get to a doctor immediately. If you suspect you have a beer allergy and experience manageable symptoms after drinking it, simply stay away from the beverage. If the symptoms don’t bother you very much, they probably aren’t causing any long-term health problems. That said, if you like alcohol and don’t have an intolerance, there are other options available. The most common beer allergy causes are ingredients such as malted barley, wheat, sorghum, or other grains. If you have allergies to other wheat products, the way you feel after a beer is likely a result of those allergies. Cold or Allergies: What Is the Difference? “Allergic to Beer: Cause, Solutions and More!” MD-Health; http://www.md-health.com/Beer-Allergy.html, last accessed August 2, 2018. “Alcohol intolerance,” Mayo Clinic; https://www.mayoclinic.org/diseases-conditions/alcohol-intolerance/symptoms-causes/syc-20369211, last accessed August 2, 2018. Song, Z., et al., “Sensitization to beer ingredients in Chinese individuals with beer allergy: a clinical study of 20 cases,” International Archives of Allergy and Immunology, 2014; 163(2):135-41; https://www.ncbi.nlm.nih.gov/pubmed/24356415. “Are Hidden Ingredients in Your Beer Making You Sick?” Cleveland Clinic, August 10, 2015; https://health.clevelandclinic.org/are-hidden-ingredients-in-your-beer-making-you-sick/, last accessed August 2, 2018.